If you’re a comedian and the world’s fate is in your hands, it’s no laughing matter. 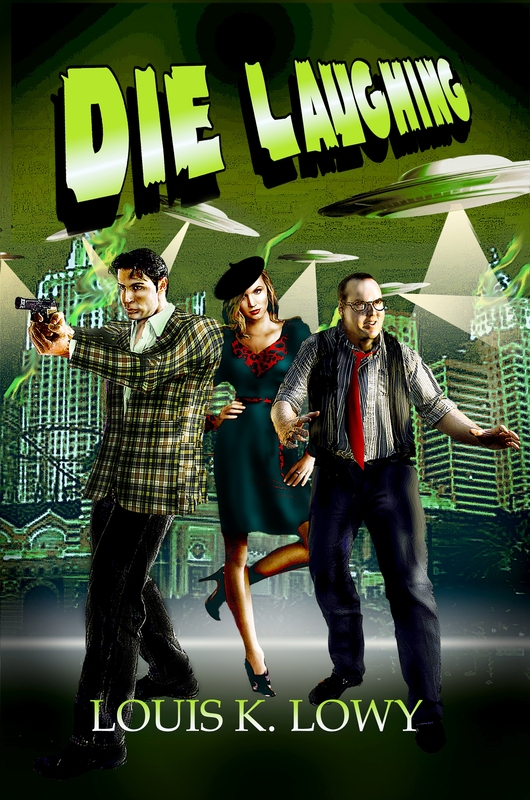 Die Laughing, a humorously dark science-fiction novel, is set in the 1950s of flying saucers, communist paranoia, and live television. Beamed aboard an alien spaceship, Las Vegas funny man Sam E. Lakeside is forced to participate in a plan to rob the earth of its oil. When the shape-shifting aliens and their leader – a power-hungry mobster – murder Sam’s best friend and manager, Sam vows revenge. He recruits a blacklisted comic book writer and the mobster’s girlfriend, and drags them cross-country to thwart the aliens. Their journey takes them to New York City and The Steve Allen Show, where the key to the alien’s conquest lies. Sam, embroiled in an escalating tangle of violence, love, and lies, is forced to choose between what he wants most in the world – to be a star – or the planet’s survival. engaging. unexpected plot turns. characters who amuse you, frighten you, delight you. colorful setting. very accurate restorations of the time frame in which the story took place. well-researched; clearly and vividly written. well-done piece of work. a good read.